A beautiful Monday to all our PISO FARE friends! Do you have plans to travel in the next several months? Look at the latest Air Asia promo fare 2017 to local and international routes! Most of the Air Asia sale tickets can be used for travel for the month of March, April, May, June, July August 2017 except for some routes which have slight different travel dates. 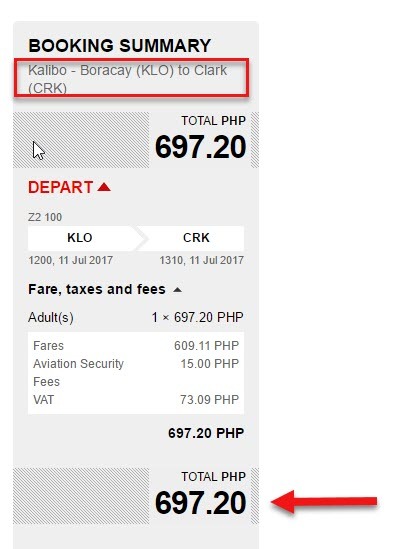 Featured on this sale are the new routes Clark to Boracay (via Kalibo) promo flights for as low as P699 for one way trip while the sale seat Kalibo to Clark is only P699. Fly from Caticlan to Cebu for only P797 while the Cebu to Caticlan route cost P897. From Manila, lowest fare is the Manila to Cebu promo at P999. Travel from Cebu to Manila at P1,114 sale ticket.. Experience spring in Taipei! 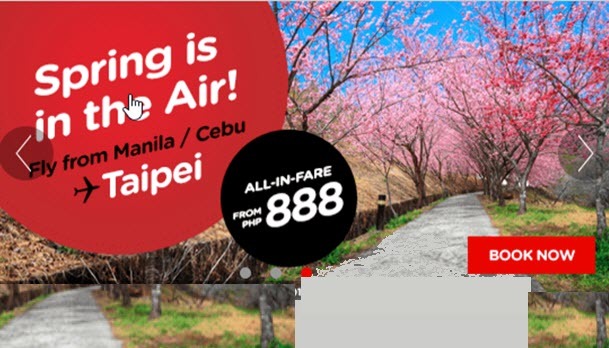 Fly to Taipei from Manila or Cebu for as low as P888. Here is the 2017 List of Holidays and Long Weekends to help you decide on your travel dates. Air Asia sale tickets are valid for one-way flight. Round trip ticket can be booked depending on promo ticket availability. Sale tickets are limited and may not be available on all flights. Promo fares are subject to availability of seats! Book your tickets via www.airasia.com to get the promo. 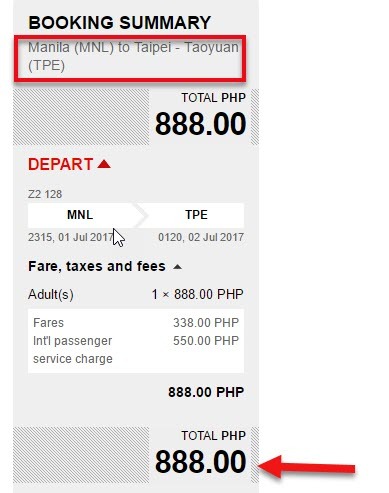 The Air Asia sale tickets cover the base fare, taxes and fees and 7 kilos hand carry bag. Checked baggage allowance is not included in the fare. So, when you are bringing several bags or heavy luggage, better to get a Checked Baggage Allowance during initial booking. Checked baggage are more expensive when you add it after initial booking or paid at the airport. For example, 20 kilos checked baggage on domestic trips at initial booking is P320, after initial booking it will cost P368. Maximum checked baggage allowed at the airport is 15 kilos with a baggage fee of P800. Air Asia tickets can be booked online even without a credit card or ATM card. Read How to pay Air Asia promo ticket booking without a credit card. For inquiries, please contact Air Asia hotline number: (63-2) 722 2742 between 7AM-11PM. For more promo fares, PISO FARE of Air Asia, Cebu Pacific, Philippine Airlines as well as travel tips and updates, visit and follow us in our Facebook page: PISO FARE TICKET!